Fully furnished accommodations for families, friends or small groups with June Lake nearby. Stay with us in June Lake, California, the heart of the Sierra Nevada Mountains. Our little town is nestled between multiple high sierra lakes and surrounded by natural beauty so typical of our western heritage. With so much to offer, this June Lake vacation condo will become your favorite Interlaken destination for years to come. During the Spring, Summer and Fall, pursue the plentiful and tasty rainbow trout found in June Lake, Gull Lake, Silver Lake and Grant Lake. During the Winter months, take advantage of that feeling of having the ski mountain all to yourself on the June Mountain ski and snowboard resort. The powder skiing is exceptional for beginners and back country skiers alike. Our area is rich in California history and the beauty of nearby Bodie State Park and Yosemite National Park is breathtaking. Take advantage of the many hiking trails through the back country, and don't forget the Pacific Crest Trail and John Muir Trail right here in our backyard. Biking of all kinds has many opportunities, like biking along the Aspen tree-lined streets of June Lake, to the challenging mountain bike trails. Your vacation condominium here at Interlaken is centrally located, and includes outside decks overlooking the lake, which make it the perfect place to relax after a long day of play. 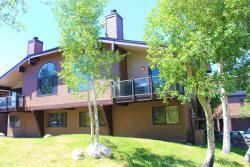 A large 3 bedroom condo overlooking Gull Lake, with direct views of the June Mountain ski area, includes 3 full baths. In addition, the loft has 4 twin beds, perfect for kids. This condo provides sleeping accommodations for up to 12. Wireless internet included. There is a queen sized bed in each of the bedrooms, four twin beds in the loft, and queen sleeper sofa in the living room. The dining room table seats eight comfortably and is next to the bar with seating for four more. LCD HD TVs with smart blue-ray DVDs in the living room and upstairs bedroom. TVs with DVD players in the master and middle bedroom. This condo has a phone with free local calls. The gas log fireplace in the living/dining area can heat the rooms even on the coldest evenings. Gas BBQ is on the deck overlooking Gull Lake with full mountain vistas. Three spas are located in the complex with easy access. The woman I spoke to was friendly and super helpful! Thank you so much! The property was amazing! The view is amazing and even though the fishing was poor, this was the best trip we have ever had in the Interlaken properties! Good comfortable and quiet spot for winter vacation. Your team was very responsive and friendly, thank you! Actually I called to get information on the condition of your condo offering. The young lady that answered the phone was friendly and courteous. Because of her I decided to give your Interlaken #10 a try. Checking out was easy, drop the key off snag a lip balm and leave. Our group has been coming to JUNE lake for 15 years on an annual fishing trip, we have stayed at a myriad of places, some times 4 to a cabin. A few places were large enough for 8-10 of us. By far your accommodation's were the best yet. We all agreed to try your condo or cabins first next year. The team was very kind and helpful. It was our first time visiting the June Lake Loop so we had a few questions that were answered completely and kindly. We loved the home. It was perfect for our family. We would like to stay there again in the future. The staff were very pleasant and professional. Everything was ready upon our arrival with no hassles or delays. The check out was a breeze, just dropped off the Keys and everything was handled for us.